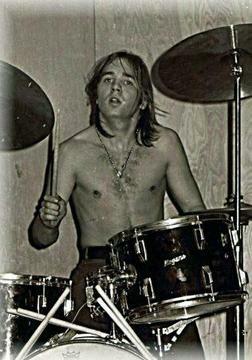 Driscoll joined the Electric Elves in 1967, fronted by Ronnie Dio. Along with other members of Elf, he was recruited by Blackmore in 1975 to play on his solo album which became ‘Ritchie Blackmore’s Rainbow’. Upon completion of the album, the band members (other than Dio) were fired and replaced. Craig Gruber and Driscoll were particularly annoyed at the way Blackmore had initially hijacked their band just to secure the services of their singer. Driscoll never really hit the big time but continued drumming with low level bands, even playing with Gruber again in Bible Black. Driscoll continued with small time sessions and even secured a day job to help with finances. He was discovered murdered in a friend’s home in Ithaca, New York in June 1987. The murder is still unsolved to this day. Shame, thought he was an excellent drummer. His work on 1st rainbow Lp was very like Ian Paice’s style. Shame that Blackmore used him and the others just to secure the services of Dio. Maybe we can see why Gillain and Coverdale found it difficult to get on with him. What can’t be taken away is Gary Driscoll’s contribution to a great rock album.